The daffodils started pushing up in an unlikely part of the park–on the sledding hill facing the street. I assume the bombers were assembling their ingredients then. At first, no one saw the new leaves in our park. By the time the buds came up, the bombers had finished their work; had headed downtown. I was running in the park not far from the daffodil buds that day. The gray skies and cool temperatures seemed perfect for the bright, young charity runners we knew who were running in the Marathon. Suddenly, police cars and ambulances started wailing down the parkway into town. After five minutes of sirens, a man pushing a stroller stopped where I was stretching, looked at his cell phone, and then over at me: there had just been two bombs, he said. We both hurried home–crossing the siren-laden traffic–to join our stunned neighbors in front of our TVs. On-the-spot videos splashed across the screen. The runners who hadn’t finished the race learned that the end of their race had been amputated. Bystanders and police delivered bodies alive and dead to medical personnel to be sorted to hospitals. My family learned, like so many Bostonians, that someone we knew slightly had been watching for a loved one to finish. A beautiful teenager who had attended our children’s elementary school was fighting to keep her legs. Meanwhile, in the park, during the next surreal days, dog walkers started to notice the daffodil shoots in a circle on the sledding hill. In Boston and Washington, people with higher levels of executive function than I have launched the search for the bombers, or went back to work out of necessity. I found it impossible to concentrate or write: my mind, a crater. People with higher testosterone levels than I called for revenge and talked tough. They shouldn’t have messed with Boston. This won’t change Boston, they said. But I found myself changed already, unnerved by sirens and thinking about the beautiful young girl I used to see walking into school with her mother and sister in the mornings—and her legs that might or might not be there anymore. The schoolyard scene turned ghostly as I realized it could have been any of us. Friday brought the manhunt, another day at home with family and television. We were relieved, like all of Boston, when police took the younger bomber into custody, though sorry for a wasted life. And the next day we learned of another distant connection to the tragedy through that same elementary school our children had attended. Another girl whose family we’d known, now a young woman, had known the younger Tsarnaev in her high school years and said how well-liked he had been, how well she had liked him. 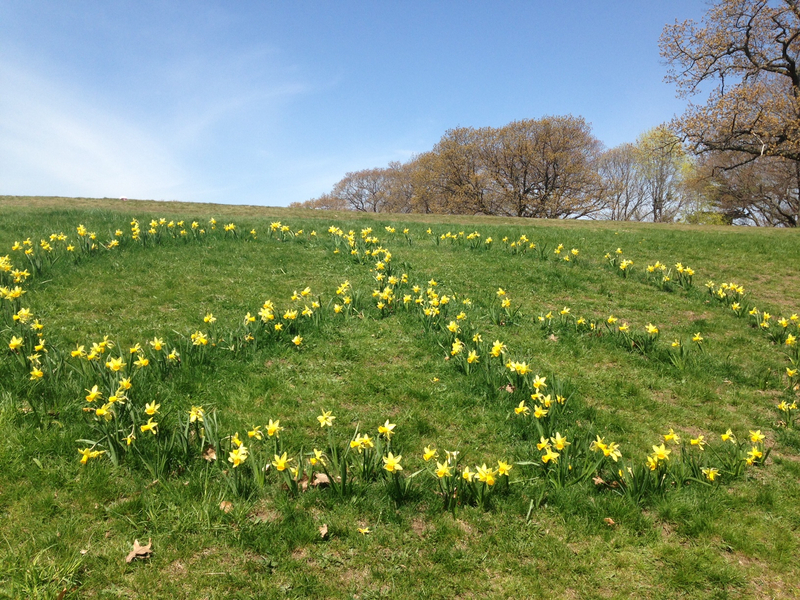 That day, in the park, a neighbor pointed it out to me: the full circle of daffodils had bloomed into a yellow peace sign on the hillside, like the one young Martin Richard had held up, grinning, with his “No more hurting people” slogan. People were stopping to photograph the flowers, or to point them out to a companion. I looked at the daffodil peace symbol and found myself distantly connected to a bombing victim, a bomber, and a beneficent peace gardener, the whole, messy scene of the human race. I felt the gravity of tragedy pulling me toward the suffering–the suffering who would drop out of the headlines over time to fight their private battles. I felt the painful need of the weird outsider in every group–the need we so often ignore. And I felt, with gratitude, the generosity of acts of love, the only antidote to the first two. So, I was happy to learn the comedic side recently: Michelangelo was, in addition to being a supremely talented artist, a great kvetch. 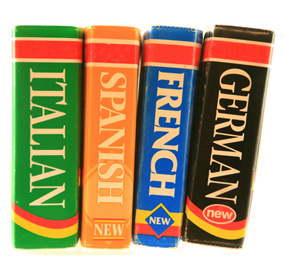 In fact, historians apply an assortment of unflattering adjectives to his personality. And yet, Michelangelo’s vigorous, perpetual complaints—in his journal and later poems—endear him to me. What writer cannot appreciate such honesty concerning the daunting creative struggle? Now we know: Michelangelo was not only an artist but a writer. What, after all, are most stories we write and read except an homage to our continual struggle to achieve, to love, or to connect (to each other, to the natural world, or the Divine) in the face of our own shortcomings? 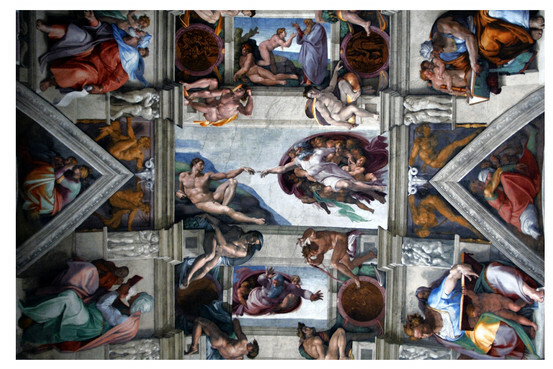 The Sistine Chapel looks more breathtaking to me in the light of Michelangelo’s miseries. His reach for a glorious vision, from the depths of his orphaned unhappiness, makes him, for me, kin to all struggling artists and writers.